As one of the few holistic dentistry practices in central Pennsylvania, we continually seek treatment methods that won’t compromise your health in the short or long-term. Your health and well-being start in your mouth, and poor dental care can lead to numerous other health issues. Keeping true to this mission, members of our staff (Kathy Calabretta, Cathy McMaster, Chris Musser and Heidi Collier) recently completed oxygen/ozone training and we are now able to offer it to those who are interested in infection control without the toxic side effects you’ll find with other treatment methods. Here are a few quick facts about oxygen/ozone therapy for those of you who are looking to find out more about our new offering. Dr. Allison & his staff continually seek to improve the holistic dentistry options available to our patients. Oxygen/ozone therapy is a disinfecting method where an oxidative burst kills any infective microorganisms. The oxidative burst has additional benefits to your health, including better blood flow, quicker healing, and an enhanced immune response. How does it help with dental care? bone, which could be treated with oxygen/ozone therapy. For those of us who are health conscious and don’t want to worry about the side effects of pharmaceutical drugs, oxygen/ozone therapy is an effective alternative to these common problems. Are we sure oxygen/ozone therapy is safe and effective? Originally introduced by Swiss dentist E. A. Fisch in the early 1900’s, oxygen/ozone therapy has evolved and advanced quite a bit. Scientific literature supports the effectiveness and safety of oxygen/ozone therapy, and the International Academy of Oral Medicine and Toxicology reviewed and accepted it as scientifically valid. 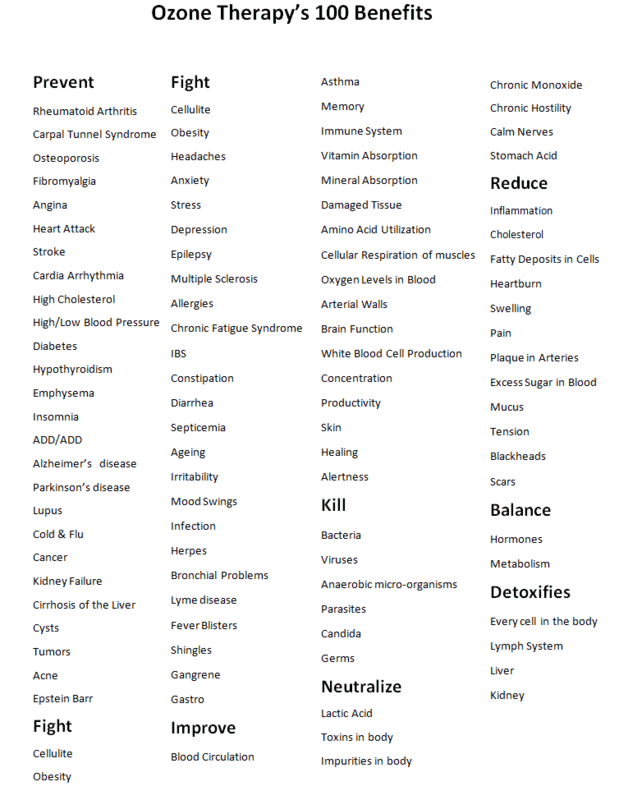 Here’s a quick graphic of over 100 benefits of Oxygen/Ozone Therapy. If you’d like to learn more about Susquehanna Dental Arts new therapy option, stop by, give us a call, or send us an email today! Posted in oxygen/ozone therapy and tagged E.A. Fisch, International Academy of Oral Medicine and Toxicology, oxygen therapy, ozone therapy, periodontal disease on May 27, 2016 by admin.